Incremental improvement is not enough to win in today's exponentially disrupted business environment. It is not enough to win today. We have to be able to continue to evolve today and in the future. In the world of unprecedented disruption and market turbulence, Business Transformation today revolves around the need to generate new value. We need to unlock new opportunities, to drive new growth, and to deliver new efficiencies. Yet, the reported failure rate of large-scale change programs has hovered around 70% over many years. The momentum of a Business Transformation has not been sustained and bad habits keep on reasserting themselves. 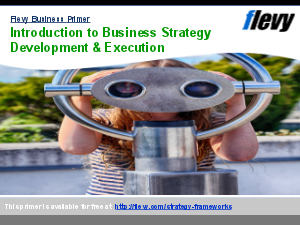 This presentation discusses the 5 essential elements or disciplines successful companies have undertaken to achieve sustainable Business Transformation. 1. Take an independent perspective. 2. Think like an investor. Our company needs to master these disciplines and have it baked into our company's DNA system. When this happens, we are assured of an ingrained, repeatable, and replicable process that drives better and better results long after the transformation is over. 11-page PDF document. A Case Study of a Chinese organisation is presented to highlight the role of organisational culture in change management that is grounded in strategic thinking.